If you are looking to celebrate Valentine's Day with a delicious celebratory wine or are just looking for a great gift for the wine lover on your list, then let me introduce you to the Sparkling Wine from the Country of Georgia! 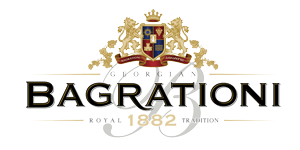 Bagrationi 1882, a historic sparkling wine producer from the country of Georgia in the Black Sea region of Eastern Europe, has recently announced its entrance into the U.S. wine market. For the first time in the New World, wine enthusiasts can now experience these unique sparkling wines from the very place where winemaking was born. With the introduction of Bagrationi 1882, wine consumers in America can now enjoy the favorite sparkling wine from the world’s oldest wine growing region. Bagrationi wines, from one of the world’s oldest wine-growing region (7,000 + years), are grown in Georgia at the same latitude as N. Spain, S. France, Italy, and California. They’ve been around since 1882 (now that’s longevity! ), and produce four tasty sparklers (Classic Brut, Classic Extra Dry, Reserve Brut and their premium Royal Cuvee). If you are looking for a great celebratory wine to make a toast with to your loved one this Valentine's Day, you have got to turn to Bagrationi Sparkling Wine! You will feel like you are in a different country far, far away when you drink this wine from Georgia! It tastes great - fruity and light - and it will be a great addition to any V-day dinner! Buy It: You can purchase Bagrationi sparkling wines at price points ranging from under $10 to $35 and are available in your local wine retailers and online.